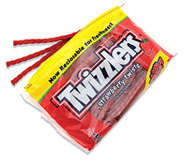 Since April 2009, the Y&S Candies plant in Lancaster, PA, home of the Twizzler, has been upgrading its four 20-yr-old robotic case-palletizing cells, replacing aging robots with new, state-of-the-art Motoman Inc. models designed for palletizing applications. While the project originally was specified as a straight obsolete-equipment replacement for Y&S, a division of The Hershey Co., the robot upgrade has made several significant improvements to the plant’s palletizing operations, including improved productivity. “We’ve seen an increase in speed of as much as 20 percent, from eight cases/min to 10 cases/min,” says Hershey senior packaging-systems engineer and project manager Alex Diaz. The four robots at Y&S are arranged in two groups of two each, and each robot will handle cases from up to four packaging lines simultaneously, depending on the case sizes. Diaz belongs to a team of packaging-system engineers employed out of The Hershey Co. Global Operations Engineering Div. Diaz, along with Andrew Brighton, staff engineer at the Y&S plant, decided early in 2008 to replace the aging robots at Y&S with newer Motoman EPL models. Using fork-style grippers, two Motoman EPL300 robots pick up one, two or three bags of powdered product at a time and palletize them onto wooden pallets in the appropriate stacking pattern. Highly flexible system meets all project goals and requirements. System consists of two robot palletizing cells; each serves two product filling lines. System meets required cycle time, palletizing six bags per minute (24 bags per minute total). Depending on bag size and orientation, each robot picks one, two or three bags at a time, with each cycle averaging approximately 10 seconds per pick and place. Robots provide improved productivity, reliable production, and tighter, more uniform and stable pallet loads. Robots significantly decrease need for direct labor, while improving safety by reducing injuries. Fully automated palletizing line to reduce direct labor costs and improve safety by reducing lifting and repetitive motion injuries. Improve productivity, and create more consistent and stable loads. Palletize bagged product from four production lines with a maximum throughput of six bags per minute per line (24 bags per minute total). Palletize filled valve paper bags (polylined) of product that typically weigh approximately 22.7 kg (50 lbs), but occasionally can weigh up to 25 kg (55 lbs). Handle a variety of bag sizes and dimensions. Filled bags range from 558.8 mm L x 393.7 mm W x 165.1 mm H (22″ L x 15.5″ W x 6.5″ H) to 863.6 mm L x 482.6 mm W x 190.5 mm H (34″ L x 19″ W x 7.5″ H). Stack bags onto standard 1,219.2 mm L x 1,016 mm W (48″L x 40″ W) wooden pallets into loads that are typically 10 layers high, but occasionally may be 12 layers high. Accommodate partial loads and maximize unit loads, as required.